Baby Things I Want: Cheap Pregnancy and Ovulation Tests Available in Israel -- FREE SHIPPING! Cheap Pregnancy and Ovulation Tests Available in Israel -- FREE SHIPPING! Does anyone remember what everyone was saying during the 90's dot com boom? They predicted that in a few years, we'll all be buying everything online and that brick-and-mortar stores will all go out of business. Did that actually happen? Yeah... no. I am always on the lookout for online deals... to save time, to save money... but mostly to save on the aggravation of pushing a stroller through a crowded store with kvetchy little children in tow. My kids are actually great and they know how to behave in a mall, but if I can do my shopping in pajamas after my kids are in bed, all the better. When I find new online deals, I'm excited... it's even more exciting when it's something I actually use. What's my new favorite site? www.pregnancytestsisrael.com. I have to admit that I am a pregnancy test addict. I love peeing on those little sticks and waiting for those lines to appear. It's fun. So yes, when I crave Ben&Jerry's or feel a little queasy or cry at a silly tv commercial, my first thought is 'Oh gosh... maybe I'm pregnant!'. You can imagine how happy I was to find an Israeli website where you buy pregnancy and ovulation tests online and they come shipped into your mailbox in a little envelope. Their prices are cheaper than the drugstore; 50nis for 10 pregnancy tests or 10 ovulation tests. For 80nis, you can buy a combo pack of 10 pregnancy tests and 10 ovulation tests. If you want 5 pregnancy tests,it is 30nis. American and Israeli credit cards are accepted, or you can use your Paypal account. More importantly, you can buy them from the privacy of your own home and not have to worry about running into your nosy neighbor at the drugstore checkout counter. Shipping to anywhere in Israel is included in the price - all tests are shipped from Jerusalem and packaged in a plain white envelope (just in case you have a nosy mailman). The site is in English as well as Hebrew. It's a good idea for moms to have a few pregnancy tests stashed away in the medicine cabinet, especially if your baby is older and you're not nursing 24/7 and your cycles haven't gone back to normal. You can test whenever you want. 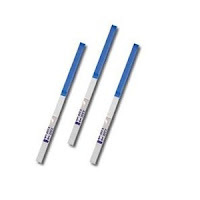 Along with pregnancy tests, they also sell ovulation tests, which are hugely helpful when you are trying to conceive. Ovulation tests work in the same way as pregnancy tests; pee in a cup, dip and wait for the lines. Ovulation tests measure the levels of LH (luteinizing hormone) in a woman's urine). A surge in LH tells you that ovulation is likely to happen in the next 12-24 hours (so... um... cook a romantic dinner and light some candles). So yeah, next time I need to buy pregnancy or ovulation tests, I am going no further than my laptop. This post was written by an anonymous guest.